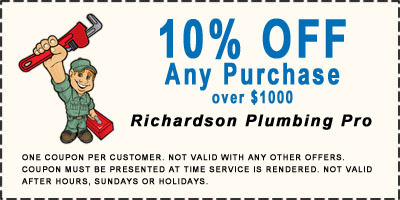 Richardson Plumbing Pro can help you to make an educated decision about what water heater best suits your home's needs with features like longevity, low operating cost, system durability, water heater enhancements, latest cutting-edge technology, environmentally sound, and top of the line safety features to name a few. Water heaters are probably one of the most overlooked appliances in your home. 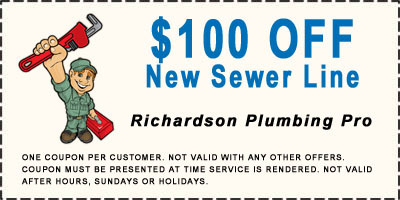 But they are also one of the most critical elements in your Richardson plumbing. If you take a minute and think about how much hot water you use on a daily basis – showers, baths, dishes, laundry… You begin to realize how important your hot water heater is in your life. Having a water heater installed that is the right size is significant. It is critical because installing the correct water heater will help ensure that you get enough water needed to supply your home. In addition, it will run more effectively. Richardson Plumbing Pro can help with those decisions. If your Richardson water heater is 10+ years old or experiencing any of the above symptoms, it may be time to consider a new water heater. Richardson Plumbing Pro technicians can install conventional gas or electric tank heaters or the newest technology in tankless water heaters. A Richardson water heater expert may ask about the size of your family, type of utilities, daily hot water usage, check the space available and assess other factors in determining which type of water heater will meet your family’s needs. Available water heaters include conventional and new tankless styles. Whichever you choose, Richardson Plumbing Pro associates will professionally install your new water heater. When the installation is complete the work area will be thoroughly cleaned, and all debris and the old water heater can be hauled away. Our work is guaranteed, and we always strive for 100% customer satisfaction. For a comfortable and clean home or business, hot water is something we can’t live without. 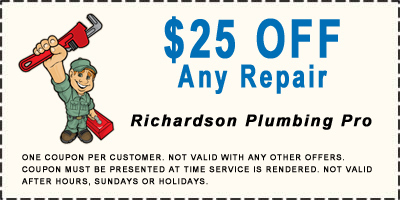 Our 24/7 emergency plumbing service is available at your convenience to address your Richardson plumbing and water heater needs. Call us now at 972-546-2974. If the pilot light on your gas water heater keeps going out, your pilot light’s orifice could be dirty and clogged, making the flame small and unsustainable. Check to make sure there is no obvious dirt and debris clogging it. If this is not the issue, there may be a problem with the thermocouple. This is the part that extends from the temperature control into the flame of a pilot light and helps the main burner fire up once the water temperature has gone too low. The pilot light could be affected if the thermocouple is faulty or does not come into contact with the pilot flame. 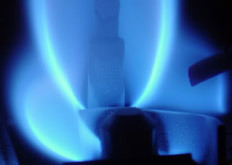 Low gas pressure or a malfunctioning gas control valve could also cause a pilot light to go out repeatedly. 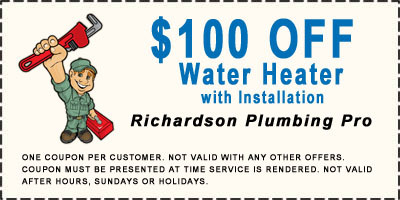 If you are having problems with your water heater, call Richardson Plumbing Pro today. According to the U.S. Department of Energy, adding insulation to your water heater tank can reduce standby heat losses by 25%–45%. This will save you around 4%–9% in water heating costs. A tank that's warm to the touch needs additional insulation. Insulating your storage water heater tank is fairly simple and inexpensive, and it will pay for itself in about a year. You can find pre-cut jackets or blankets available from around $10–$20. Choose one with an insulating value of at least R–8. A thermocouple is a sensor used to measure temperature. In gas water heaters, the thermocouple monitors the gas burner to verify that the pilot light is working and the gas is lit. In the event flame goes out, the thermocouple shuts the gas supply to the water heater. According to Consumer Reports, for the average homeowner, a tankless water heater may not be the best choice. Heating water will typically use about 30% of your home energy budget. While it’s true a gas tankless water heater can save up to 22% of your water heating energy cost, it could still take up to 22 years to break even on the additional cost. One consideration beyond cost savings is the benefit of endless hot water. 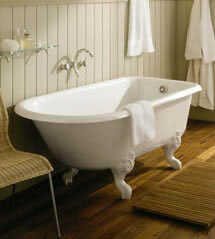 A consumer that desires this luxury can certainly justify a long term pay back for lasting household comfort. For a full analysis of your water heating options, call today. We are happy to help. The temperature and pressure relief valve (T&P) on your water heater is the main safety device for this fixture. This valve protects the tank, your home and you from serious malfunctions created by excessive heat in tank. When water becomes excessively hot, steam is created which in turn causes a pressure build up. This valve is designed to open and relieve the pressure in the tank. We recommend you test the T&P valve at least twice a year to ensure its proper operation. If your water heater is making popping sounds when heating, it may be time to flush the tank. This popping sound is created when water heats through sediment in the bottom of tank. The sounds your water heater makes can normally be eliminated through routine maintenance. For help with all your water heater needs, give us a call at 972-546-2974. Many North Texas homes have electric water heaters. While fundamentally the same as a gas water heater, the electric tank has heating elements rather than a gas burner. Most electric water heaters have two heating elements. One is in the bottom of the tank and the other in the center of the tank. Each has a separate thermostat for energy efficiency. As hot water is used, the fresh cold water drops to the bottom of the tank causing the bottom element to turn on. As more hot water is used, the center element is activated, causing rapid heating. If you notice your water heating more slowly, this may be caused by a failure or malfunction in one of the heating elements. Give us a call for the electric water heater experts. As part of your water heater maintenance program, you should always check the flue vent. The flue vent serves two purposes by exhausting combustion gases from the burner to the exterior of your home and also assists in the heat exchange for the water storage tank. If the flue vent is separated or obstructed, deadly carbon monoxide can enter your living area. A visible inspection of the entire vent is the first step. Second, when the burner is operating, you should not feel any hot air escape from the area where the tank and vent meet. If you have the slightest doubt about your vent system, turn off the water heater and call us for your Richardson plumbing expert.